4 Oct 2018 St Joseph, Bedwell, RC, Stevenage. Redeveloped church added. 20 Sept 2018 Friends Meeting House, Hoddesdon. Interiors added. 20 Sept 2018 North Watford Methodist Church. Interiors added. 20 Sept 2018 Leavesden Road Baptist Church Watford. Interiors added. 26 Aug 2018 St Bonaventure, Welwyn Garden City. Interiors added. 26 Aug 2018 St Mary, Standon. Post re-ordering images added. 11 Jun 2018 St George URC, Chaulden, Hemel Hempstead. Interiors added. 2 Apr 2018 Grace Community Church, Stevenage. Interiors added. 14 Sep 2017 United Reformed Church, Harpenden. Interiors added. 14 Sep 2017 Southdown Methodist Church, Harpenden. Interiors added. 14 Sep 2017 Friends Meeting House, Harpenden. Interiors added. 14 Sep 2017 United Free Church, Radlett. Interiors added. 8 Sep 2017 St Peter. Ayot St Peter. New interiors and exteriors added. 8 Sep 2017 Christ Church Baptist, Welwyn Garden City. Interiors added. 8 Sep 2017 St John the Evangelist, Digswell. New interiors added. 8 Sep 2017 Holy Family, Digswell. Interiors added. 30 Aug 2017 St Etheldreda, Hatfield. Many new interiors added. 30 Aug 2017 St Barnabas, Adeyfield, Hemel Hempstead. Interiors added. 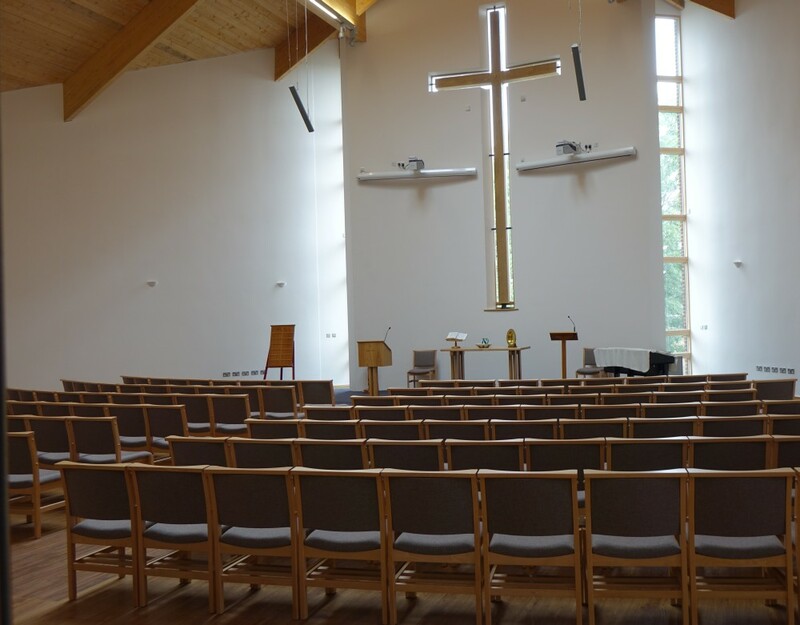 30 Aug 2017 Our Lady Queen of all Creation, Hemel Hempstead (Roman Catholic) Interiors added. 30 Aug 2017 Holy Cross and St Alban, Brickedendon. New interiors and exteriors added. 11 Jul 2017 Friends Meeting House, Handside Lane, Welwyn Garden City. Interiors added. 23 May 2017 St Michael and All Angels, Waterford. New set of images added. 13 Apr 2017 St Andrew & St George, Stevenage. Interiors added. 27 Mar 2017 All Saints, Kings Langley. Complete new set of images. 11 Mar 2017 Community of the Twelve Apostles, Kentish Lane, Woodhill (Greek Orthodox) Updated interiors showing wall paintings and icons recently added. 5 Mar 2017 Methodist Church, Pirton. Interiors added. 30 Dec 2016 Our Lady, Queen of Apostles,, Welwyn Garden City. Interiors added. 4 Nov 2016 United Reformed Church, Walkern. Interiors added. 13 Oct 2016 St Hugh of Lincoln RC Church, Letchworth. Interiors added. 6 Oct 2016 St Paul, Letchworth Garden City. Interiors added. 6 Oct 2016 St Thomas, Letchworth Garden City. Interiors added. 25 Sep 2016 St John, South Hatfield. Interiors added. 20 Sep 2016 St John the Baptist, Aldenham. Expanded set of interiors added. 16 Sep 2016 Quaker Meeting House, The Alleys, St Mary’s Road, Hemel Hempstead. Interiors added. 16 Sep 2016 Carey Baptist Church, Marlowes, Hemel Hempstead. Interiors added. 16 Sep 2016 St Francis of Assisi, Hammerfield, Hemel Hempstead. Interiors added. 16 Sep 2016 Methodist Church, Northridge Way, Hemel Hempstead. Interiors added. 16 Sept 2016 St Alban, Warners End, Hemel Hempstead. Interiors added. 16 Sep 2016 St Stephen, Chaulden, Hemel Hempstead. Interiors added. 2 Sep 2016 St Mary, Rickmansworth. New interiors and exteriors added. 25 Jul 2016 All Saints, Batford, Harpenden. Interiors added. 29 Jun 2016 Poles Convent Chapel (Hanbury Manor Hotel). Interiors added. 28 Jun 2016 Holy Trinity, Frogmore. Interiors added. 17 Jun 2016 Great St Mary, Sawbridgeworth. New interiors added. 17 Jun 2016 St James, High Wych. New interiors added. 16 Jun 2016 Holy Trinity, Bishops Stortford. Interiors added. 16 Jun 2016 Baptist Church Centre, Bishops Stortford. Interiors added. 10 May 2016 St Paul, Cheshunt. Interiors added. 25 Mar 2016 Holy Saviour, Hitchin. New set of interiors added. 25 Mar 2016 United Reformed Church, Welwyn Garden City. Interiors added. 6 Mar 2016 Transfiguration of our Lord, Stevenage. Interiors added. 19 Feb 2016 Bushey & Oxhey Methodist Church. Interiors added. 23 Sep 2015 St Andrew, Bramfield. Interiors added. 17 Sep 2015 Leaside Church, Ware. Interiors added. 17 Sep 2015 St Andrew, Stanstead Abbots. Interiors added. 17 Sep 2015 St James, Stanstead Abbots. Extra interiors added. 17 Sep 2015 Hoddesdon Methodist Church. Interiors added. 17 Sep 2015 St Catherine & St Paul, Hoddesdon. New interiors added. 17 Sep 2015 St Laurence, Wormley. Interiors added. 17 Sep 2015 Cheshunt Free Church. Interiors added. 16 Sep 2015 Waltham Cross Baptist Church. Interiors added. 21 May 2015 Baldock Methodist Church. Interiors added. 20 Apr 2015 Berkhamsted Baptist Church. Interiors added. 29 Mar 2015 St Thomas of Canterbury and the English Martyrs, Royston. Interiors added. 14 Mar 2015 St Peter, Broadwater, Stevenage. Interiors added. 14 Mar 2015 Tilehouse Street Baptist Church, Hitchin. Interiors added. 4 Feb 2015 St Francis of Assisi. Welwyn Garden City. Extra interiors and exteriors added. 19 Jan 2015 St Mary, Ashwell. Many extra interiors added. 19 Nov 2014 Marlborough Road Methodist Church, St Albans. Interiors added. 19 Nov 2014 St Luke, St Albans. interiors added. 16 Nov 2014 Hertford Methodist Church. Interiors added. 5 Nov 2014 St John the Baptist, Markyate. Interiors added. 24 Oct 2014 St Mary, Baldock. New interiors and exteriors added. 24 Oct 2014 Dagnall Street Baptist Church, St Albans. New interiors and exteriors added. 8 Oct 2014 St Joseph and the English Martyrs, Bishops Stortford. Interiors added. 6 Oct 2014 St Margaret, Ridge. Interiors added and description updated. 5 Oct 2014 St Giles, South Mimms. Extra interiors added. 2 Oct 2014 St Edmund of Canterbury, Old Hall Green. More exteriors and nearby previous chapel added. 28 Sep 2014 St Stephen, St Albans. Interiors added. 26 Sep 2014 St Mary, Childwick Green. Interiors (taken from inside rather than through window) added. 24 Sep 2014 St Nicholas, Stevenage. New interiors and exteriors added. 24 Sep 2014 St Mary, Little Wymondley. New interiors and exteriors added. 24 Sep 2014 St Mary, Great Wymondley. New interiors and exteriors added. 18 Sep 2014 St Michael and All Angels, Watford. Interiors and previous church added. 18 Sep 2014 St Teresa of the Child Jesus, Borehamwood. Interiors and previous church added. 16 Sep 2014 The Good Shepherd, Shenley. Interiors added. 16 Sep 2014 St Mary the Virgin and All Saints, Potters Bar. Interiors added. 16 Sep 2014 St John the Evangelist, Lemsford. Interiors added. 16 Sep 2014 St Luke, Hatfield. Interiors added. 16 Sep 2014 St Michael & All Angels, Hatfield. Interiors added. 16 Sep 2014 St Mary Magdalene, Welwyn Garden City. Interiors added. 16 Sep 2014 Christ the King, Welwyn Garden City. Interiors added. 16 Sep 2014 Digswell Village Church. Interiors updated. 16 Sept 2014 St Giles, Codicote. Interiors added. 16 Sep 2014 All Saints, Pin Green, Stevenage. New exteriors, description and interiors added. 16 Sept 2014 St Hugh & St John, Chells, Stevenage. Interiors added. 8 Sep 2014 Corpus Christi, Tring. Interiors added. 6 Sep 2014 Christchurch, Watford. Interiors added. 4 Sep 2014 Churches in Hitchin and Watford added to the Lost Churches page. 1 Sep 2014 Our Lady Immaculate and St Andrew, Hitchin. Interiors added. 1 Sep 2014 St Paul, Hunton Bridge. Interiors added. 1 Sep 2014 St John the Evangelist, Boxmoor, Hemel Hempstead. Interiors added. 1 Sep 2014 St Mary, Apsley End. Interiors added. 1 Sep 2014 St Saviour, St Albans. Interiors updated. 1 Sep 2014 St Peter, St Albans. Extra interiors and exteriors added. 31 Aug 2014 St Mark, Watford. Interiors added. 31 Aug 2014 St Etheldreda, Hatfield. Extra interiors and exteriors added. 31 Aug 2014 Marychurch, Old Hatfield. Interiors and new exteriors added. Description updated. 27 Aug 2014 St Michael & All Angels, Waterford. Extra interiors added. 26 Aug 2014 St Faith, Hexton. Extra interiors and exteriors added, description updated. 26 Aug 2014 St Nicholas, Hinxworth. Extra interiors and exteriors added, description updated. 26 Aug 2014 St Mary, Hitchin. Extra interiors and exteriors added, description updated. 26 Aug 2014 St John the Evangelist, High Cross. Extra interiors and exteriors added. 26 Aug 2014 St Augustine, Hoddesdon (Roman Catholic). Extra interiors and exteriors added. 26 Aug 2014 St Dunstan, Hunsdon. Extra interiors and exteriors added. 25 Aug 2014 St Mary, Hertingfordbury. Extra interiors added. 22 Jul 2014. All Saints, Radwell. New exteriors and interiors added. 11 Jul 2014. Taking Stock website link added to most Roman Catholic Church entries, some descriptions updated. 4 July 2014 St Peter, Gustard Wood. new exteriors taken is sunny weather added. 4 July 2014 St Peter and St Paul, Kimpton. More interiors added and description updated. 27 Jun 2014 Our Lady Immaculate and St Andrew, Hitchin. More exteriors added. 24 Jun 2014 Immaculate Conception and St Joseph, Hertford (Roman Catholic). Extra interiors and exteriors added and description updated. 22 Jun 2014 Ayot St Lawrence New Church. Extra interiors added. 22 Jun 2014 Ayot St Lawrence, Old Church. Extra pictures added. 22 Jun 2014 St Cuthbert, Rye Park. Interiors added. Description updated. 22 Jun 2014 St Andrew, Watford. Interiors and new exteriors added. Description updated. 22 Jun 2014 Church of the Ascension, Bedmond. Interiors added. 16 Jun 2014 St Andrew, Little Berkhamsted. More interiors added, description updated. 15 Jun 2014 St James, Goffs Oak. Interiors and more exteriors added. 15 Jun 2014 All Saints, Little Munden. Interiors added, description updated. 7 Jun 2014 St John the Evangelist, Bourne End. Interiors added. 2 Jun 2014 St John Fisher and St Thomas Moore, Borehamwood. Interiors added. 2 Jun 2014 All Saints, Borehamwood. Interiors added.